For almost 50 years, Covercraft has been providing high quality interior and exterior protection products to suit the needs of automotive enthusiasts everywhere. Covercraft has certainly built a reputation among car owners, but it doesn�t stop there. The folks at Covercraft are aware that your pet is a part of your family, and as such requires a designated spot in your vehicle. 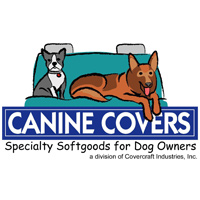 The Canine Covers division of Covercraft provides you with the products that you need to protect your vehicle's interior, while keeping your pet comfortable. Canine Covers offers a full range of products to meet your specific needs. Canine Covers products are constructed from high quality water repellent, padded, breathable, non-slip, adjustable, and machine washable fabrics. They are available for the rear seat and cargo areas of your vehicle. Canine Covers offer custom, semi-custom and universal fit options for rear seat coverage along with cargo area liners. A Door Shield will protect your plastic door panels from scratches, gouges and muddy paw prints when your dog wants to feel the wind in his fur. With such a wide selection of products, we recommend reading about each product�s specific features before deciding which one best suits the needs of your pet. Canine Covers also offers the Ultimate Dog Bed for use at home or on the road. These super comfortable pet beds come in several sizes and colors and feature fluffy bolsters on three sides to ensure your four-legged friend�s comfort. With three rugged fabric options, the Ultimate Pet Bed can easily be tossed into the back of your SUV when a road trip is in order. Zippers allow you to remove the cover from the padding for easy machine washing. Canine Covers come in a variety of patterns and fabrics. Click on the product that you are interested in to find out what options are available. Keep your pet comfortable while protecting the interior of your vehicle with Canine Covers.